There are (literally!) thousands of types of flowers, and infinite combinations of colors and arrangements that you can create with them. So how do you narrow it down to the perfect blooms for your wedding? Start with these basic, must-know tips. Have a good idea of what you’re ready to spend on flowers before getting your heart set on specific blooms or arrangements. The cost of wedding flowers ranges widely (typically between $2,000 and $6,000) depending on the types of flowers you choose, how delicate those flowers are and, of course, how many arrangements you’ll need and how elaborate they’ll be. So set your budget, then look for inspiration — not vice versa. 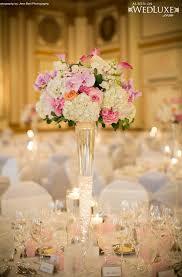 Focus your flower budget on the areas of your wedding that will be in the spotlight. Your bouquet, a signature element at the ceremony (like the huppah or pedestal arrangements) and reception centerpieces should top your list of priorities. Use leftover cash on the extras like decor for the cake table, guest book table and cocktail hour.